God always takes the initiative in His love relationship with us. The trouble is too many of us miss His constant invitation to a most extraordinary relationship. We begin to philosophize it away, or deny it, or simply call it coincidence when anything good comes our way. It’s like we receive love letters constantly each day but we never get to know the one who sends them. We deny they come from anyone. Dear friends, someone deeply loves you… Sit up, look up, take note that God so desperately loves you. Get passed all the noise of our cultural Christmas, and look to the simple yet extraordinary #Christmas miracle when God came down for you. God is with YOU. Do you see Him in every moment? Look and you will see… You. …Are. …Loved… by a God who is the author of all perfect love. Open the door and receive this love in every way, in every circumstance, in every joy, and every hurt. His love is what turns brokenness into wholeness, ashes into beauty. Life is sweeter when you know the One who sends you His love in every moment of every day. Every relationship, every friendship is sweeter when you build it on His perfect love. Even every moment of loneliness can be a sweeter moment with Him alone, the Creator of the Universe. Look up. Love has come down to you in this moment. 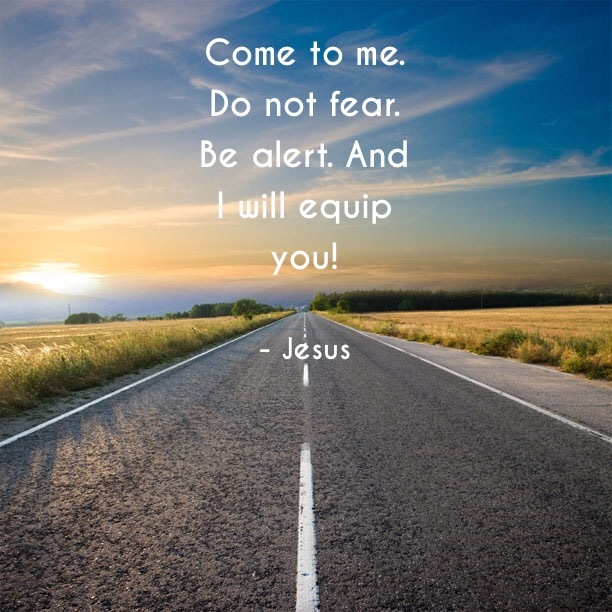 I will equip you fully. My Presence, My Word, My Spirit. Come to Me when you are heavy burdened and you will find rest for your souls. The only way to learn trust and obedience and faith is to go through things you don’t understand. This is where it begins …when you’re all alone and afraid and things don’t make sense. This is where you hang onto the message of the cross. God loved you enough to die for you. That’s where trust begins. Plans…? Hold them loosely… Instead, bask in His love! Before my sabbatical, there was a pastor who warned me to make plans and cut them in half and then cut them in half again. I ran into his wife the other day who shared the full story of his sabbatical experience. It was a hard one for him to learn. Within the first month he went back to the office to work. He couldn’t easily take the act of not doing ministry; of not being Martha and instead of being Mary lingering at Jesus’ feet. His leadership asked him to make a list of things to do and cut it in half and then cut it in half again. If he was to return to the office before the end of the sabbatical, he would be fired. As I look back so far at my sabbatical; two months out of the three, I think 90% of my plans, which have been very few, have fallen through. Instead, the things that other people have planned for me, or unexpected meet ups, or unexpected promptings and nudges have been sweet surprises. 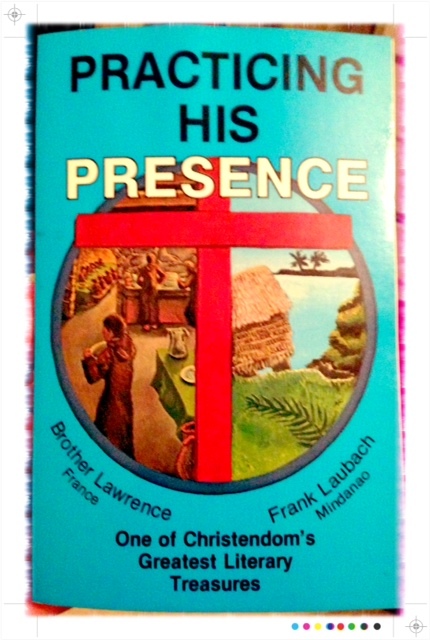 Instead of planned events and outings, (honestly, I’ve barely driven anywhere as I’ve rediscovered my beautiful neighbourhood), the majority of my time has been spent quietly in the presence of God, much like Brother Lawrence and his practice of the presence of God. I have read his journals and others who practiced the same way of being constantly mindful of Jesus’ faithful presence. Throughout the day, I’ve learned, more than ever before, to speak words of worship to him, to call on his name, to give thanks, to cry out to him, to be in tune and alert to his presence around me. This once high-energy and highly driven person has somehow learned to be completely at peace doing nothing in the presence of God and listening for his voice and speaking to him. An hour or two will go by and it’ll feel like an instant. And I come away feeling absolutely full. I didn’t spend this precious time with unnecessary noise in order to suppress longing or appetite. I didn’t even spend it doing research and deep Bible study in order to satisfy my hunger for knowledge. Instead, I spent hours simply and quietly with Jesus, the creator of the universe who somehow loves me even as if I were his favorite. He is holy. I am so unworthy and yet he loves me. Embracing this truth in a way without interruption or even without another’s interpretation has completely wrecked me, in a wonderful new way. So, I have learned to hold plans loosely, and I’ve learned to just sit in his lap and linger and become completely overwhelmed with his love for me. “I am your Lord! I am the Friend who is always with you, but you must remember that I am also your Lord. I am King over all. And I want to be the King of your life. As you begin each day, talk to Me about it. And as you go through your day, keep checking in with Me. Keep asking for My guidance. It’s okay to make some plans, but be open to changes in those plans. I may have other ideas for your day. I have and will be sharing quotes from it in my posts. As a result, I’ve put reminders in my phone at different points of the day. In the morning: “Father, what do you desire?” In the afternoon, “Everything is created for His glory!” And in the evening: “I thank you Jesus!” These reminders help to redirect my focus to Jesus, His glory, to talk and listen to Him, and to direct me to worship Him! In my connecting with depression sufferers, I have learned that much depression, including my own in the past, is indeed caused by anger and bitterness caused by hurt done by others. It makes me ponder that if Jesus had allowed fear to prevent him from being our sacrifice, you and I would still be killing lambs. He not only confronted but defeated THE (Capital A) Abuser. Jesus’ perfect love for you and I cast out any fear He may have had. A few years ago, studying the book of Isaiah, I was deeply impacted by the fact that God called Isaiah, not to be successful, but to be faithful. What? Yup. In fact, God warned him that his ministry would have no converts. One could ask, “Why bother?” Our human voices ask ourselves, “What’s the point?” Yet, it’s this unconditional love of God that calls us to love unconditionally without ever expecting anything in return including results. Today I read this quote from Henri Nouwen which rings the same tune of faithfulness over and above success. I am reminded that I must seek to be faithful in God’s ministry and leave the outcome up to God, no matter how painful it is to watch those you love refuse God’s saving love. “Many people live with the unconscious or conscious expectation that eventually things will get better; wars, hunger, poverty, oppression, and exploitation will vanish; and all people will live in harmony. Their lives and work are motivated by that expectation. When this does not happen in their lifetimes, they are often disillusioned and experience themselves as failures. Do I worship Creator God, or the god of successful ministry? Am I more concerned with God’s reputation and His great name, or my own reputation and my own name in ministry? Read… Need Prayer? | Mary DeMuth. If we have the eyes to see, we will come to know and understand that brokenness purifies our vision and chisels away all that keeps us from fully knowing the heart of God. If you and I want to recover from the losses of life, we must catch a vision for the greater role that we were designed to play and see a bigger purpose beyond ourselves and our losses. In other words, we must slowly begin to see with eternal eyes that which is so difficult to see when loss first assaults our hearts—the story isn’t finished yet. This is a journey, not a race. Read… The Necessity of Brokenness | Write Where It Hurts. If you’re going through struggle, be open to God’s lesson, wisdom, and meaning in the midst of your hardship. The greatest times of growth and learning for me have been in hardship. After that has come fruitfulness. Trust God to carry you and strengthen you.